The 21 claims of the patent were rejected by the USPTO in a "final office action," as they were anticipated by previous patents or unpatentable. Known as the "pinch-to-zoom" patent, it covers the ability to distinguish between the scrolling movement of one finger and two-fingers gestures like pinch-to-zoom on a touch-screen to activate certain functions. Apple has up to two months to respond to the USPTO decision. In a filing in April after USPTO rejected multiple claims of another patent in a similar final office action, Apple said it had further options, including appeal to the Patent Trial and Appeal Board and seeking judicial review. Claim eight of the patent was involved in Apple's lawsuit against Samsung in the court, according to a filing Sunday by Samsung in U.S. District Court for the Northern District of California, San Jose Division. A jury last August awarded Apple US$1.05 billion in damages, but the court has ordered a partial retrial to review the damages to be paid to the iPhone maker. The jury found at trial that 21 of 24 Samsung smartphones and tablets infringed claim 8 of U.S. Patent No. 7,844,915('915 patent), Samsung said in its filing on Sunday. The claim relates to "determining whether the event object invokes a scroll or gesture operation by distinguishing between a single input point applied to the touch-sensitive display that is interpreted as the scroll operation and two or more input points applied to the touch-sensitive display that are interpreted as the gesture operation," according to a USPTO document filed in the court by Samsung. The USPTO ruled claim eight was anticipated in U.S. Patent No. 7,724,242 awarded to Daniel W. Hillis and Bran Ferren. "Hillis teaches distinguishing the number of contact points and determining whether the event object matches a gesture pattern," the USPTO wrote in its decision. The USPTO rejected in April multiple claims of another patent that figured in the lawsuit, known as "overscroll bounce" patent. Apple, however, said in a filing that the reexamination is not finished, and it is entitled to file a response to the action which may result in a withdrawal of the rejection or certification of the claims under reexamination. The company also raised the possibility that it may appeal to the Patent Trial and Appeal Board, and if unsuccessful, may seek judicial review in the U.S. Court of Appeals for the Federal Circuit or the U.S. District Court for the District of Columbia. A similar filing is likely from Apple in connection with the rejection of the '915 patent, even as Samsung is expected to argue for lower damages. 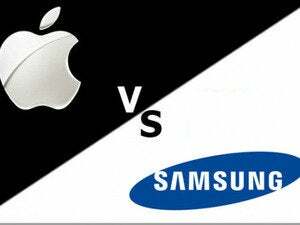 The jury awarded damages to Apple with regard to all but two products found to infringe the '915 patent, Samsung said in its filing.